Africa currently hosts over 100,000 peacekeeping personnel. Contributions by African nations are rising and are more diversified—with some big exceptions. Figure 1. Top African Contributors to Peacekeeping Operations. Sources: United Nations Department of Peacekeeping Operations, African Union. Note: Contributions to UN as of Dec. 2015; contributions to AU undated. Together the 10 peacekeeping operations in Africa today rely on over 100,000 troops, military observers, police, and civilians from around the world. The mandate of these missions has steadily expanded over the years. In addition to protecting civilians, peacekeepers now regularly face irregular forces like al-Shabaab, al-Qaeda in the Islamic Maghreb (AQIM), or the now-defunct M23 militia in the Democratic Republic of Congo. Contributions from African nations themselves—over 65,000 personnel—have been indispensable to these efforts. They serve as a commitment to regional peace and security for both moral purpose and mutual interest. They also reflect the sustained efforts of African states and their multilateral bodies to overcome the challenge of collective action in the face of war, natural disaster, or genocide. The mantra “African solutions for African problems” reflects this drive (figure 1). When looking at trends in the African peacekeeping contributions, three lessons stand out. Between 2010 and 2015, 14 of the 18 top African troop contributing countries increased their contributions, boosting the continent’s total by 46 percent—from 32,000 to 47,000 (figure 2). Figure 2. 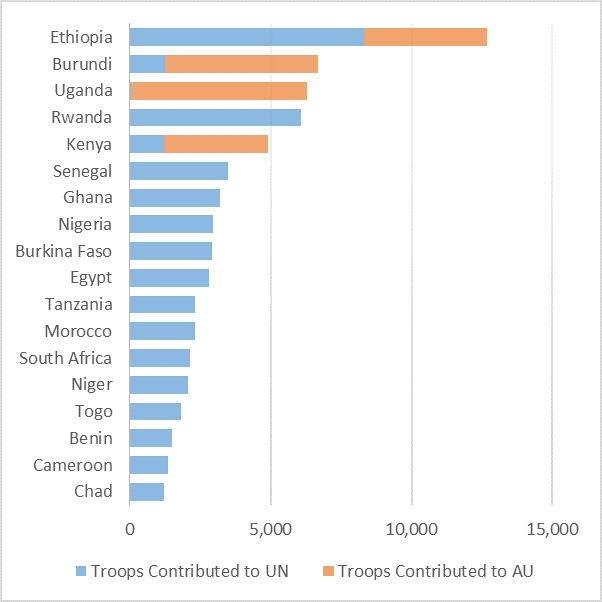 African Contributions to UN Peacekeeping Operations, 2010–2015. Source: United Nations Department of Peacekeeping Operations. Note: All personnel levels from December of that year. “Others” are shown in figure 1. Notably, Ethiopia was responsible for a full 40 percent of the total increase from 2010 to 2015. As of 2015, nearly all of Ethiopia’s UN troops were deployed to Darfur and Abyei (its AU peacekeeping troops are in Somalia). 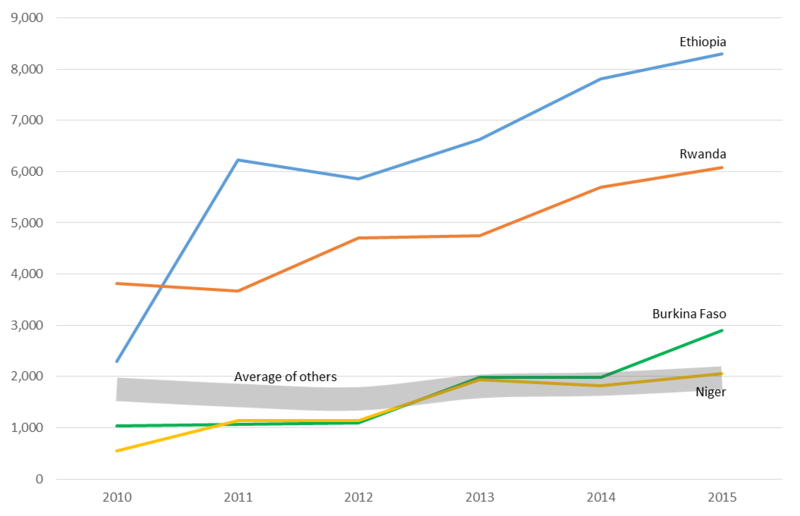 The spike in contributions between 2010 and 2011 reflects the beginning of UNISFA in Abyei, where Ethiopia provides nearly all of the mission’s troops. It also garnered positive attention for its ability to deploy those troops less than a month after the UN Security Council authorized it. In September 2015, Ethiopian President Mulatu Teshome said the country will strengthen its role in peacekeeping still further. Another noticeable boost in contributions came from Rwanda. While it started the decade already ranked as the third largest African troop contributor, Rwanda doubled that contribution by 2015 to 6,000. Most of those troops were deployed to Sudan or South Sudan. Other notable increases over the five-year period came from Burkina Faso and Niger, which both contributed to the UN mission in Mali after Islamist militants took control of the northern half of the country in 2012. Senegal, too, was an important troop contributor to Mali. It sent 500 troops in 2013 and had nearly 1,000 troops and police based there by 2015. Standing out from the general trend of increased contributions are Egypt, Nigeria, and South Africa. (Uganda’s UN contributions also declined, but insignificantly.) These three countries collectively reduced their contributions almost by half between 2010 and 2015, from nearly 14,000 to just under 8,000 (figure 3). Figure 3. Contributions by Egypt, Nigeria, and South Africa to UN Peacekeeping Operations, 2010–15. Source: United Nations Department of Peacekeeping Operations. Note: All personnel levels from December of that year. The actions of Nigeria and South Africa are particularly impactful for sub-Saharan Africa. Both countries are relative military heavyweights and have historically served as forces for stability. In contrast to states that deploy mostly to neighbors, Nigeria and South Africa have demonstrated a capability to extend more distant peacekeeping services. Yet domestic challenges seem to have shifted their focus inward. Nigeria became consumed with a counterinsurgency campaign against an increasingly violent and capable Boko Haram. That in itself is an important element of consolidating regional peace and stability, but at the same time deprives the continent of one of its largest, most capable, and important peacekeeping partners. Indeed, in the 1990s, Nigeria led a regional ECOMOG force into Liberia and Sierra Leone, then into Guinea-Bissau. It served as majority funder of the effort and applied full-spectrum use of its army, navy, and air force. In the early 2000s, Nigeria again led a regional force (which later became a UN mission) into Liberia, while contributing to the UN’s MINUCI mission in neighboring Côte d’Ivoire at the same time. With this history of relatively robust contributions, a reduction in Nigerian involvement leaves the region more vulnerable in the event of other major crises. South Africa’s UN troop contributions did not fall significantly from 2010 to 2015, but they did remain stagnant. This stands out because South Africa has historically paired its peacekeeping deployments with political and diplomatic mediation efforts in support of its growing image and role as a “middle power” in the international sphere. Yet less-powerful African states now contribute far more peacekeepers, even as a range of challenges this decade might have benefited from South Africa’s involvement. For example, South Africa played an important role in sending peacekeepers to Burundi in 2001, a contribution that was complemented by diplomatic efforts to shepherd the country toward peace. Since Burundi slipped back into crisis in 2015, however, South Africa has at no point attempted reengagement. Indeed, South Africa seems to have ignored opportunities to leverage its distinctive role as an upper-middle-income sub-Saharan democracy to become a more crucial leader and norm-builder in continental security. Here too, internal challenges may have played a role. 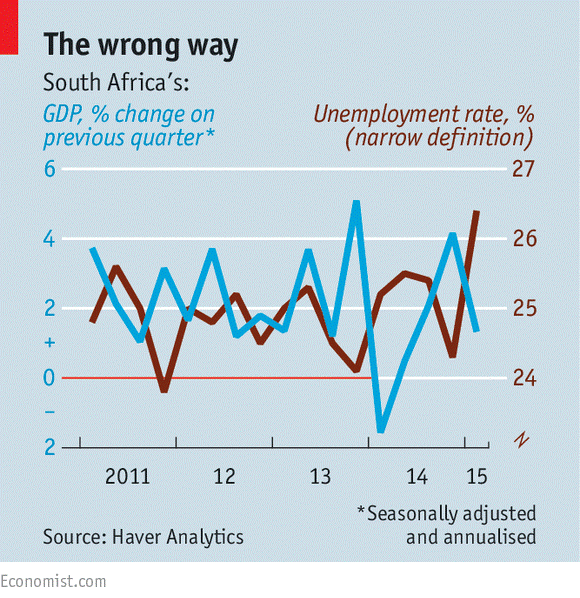 South Africa has faced successive economic shocks in the past few years and volatile changes in GDP and unemployment rates (figure 4). Figure 4. South Africa’s Economic Turmoil. Egypt is another African country that has contributed peacekeepers far from its borders, and its contributions have also declined. In 2010, it ranked second among African contributors, providing about 5,400 UN peacekeepers, or about 17 percent of the continent’s total for that year. By 2015 its contributions had been cut in half to less than 3,000, reflecting a drawdown in Egyptian peacekeepers in the Democratic Republic of Congo, Darfur, and South Sudan (MONUSCO, UNAMID, and UNMISS, respectively). Egypt has also maintained small contributions in Western Sahara and Côte d’Ivoire throughout 2010–15. It is tempting to attribute Egypt’s overall decline in peacekeeping troops to the internal strife it has faced. Yet Egypt did contribute about 1,000 personnel to the UN mission in the Central African Republic in 2015 (MINSUCA), and some of the other missions it was involved in were drawing down as planned. Whatever the cause, it is notable that Egypt’s overall peacekeeping contributions have dropped at the same time as those of Nigeria and South Africa. The effect has reduced involvement by the continent’s leading military powers in exporting peace operations far beyond their borders. 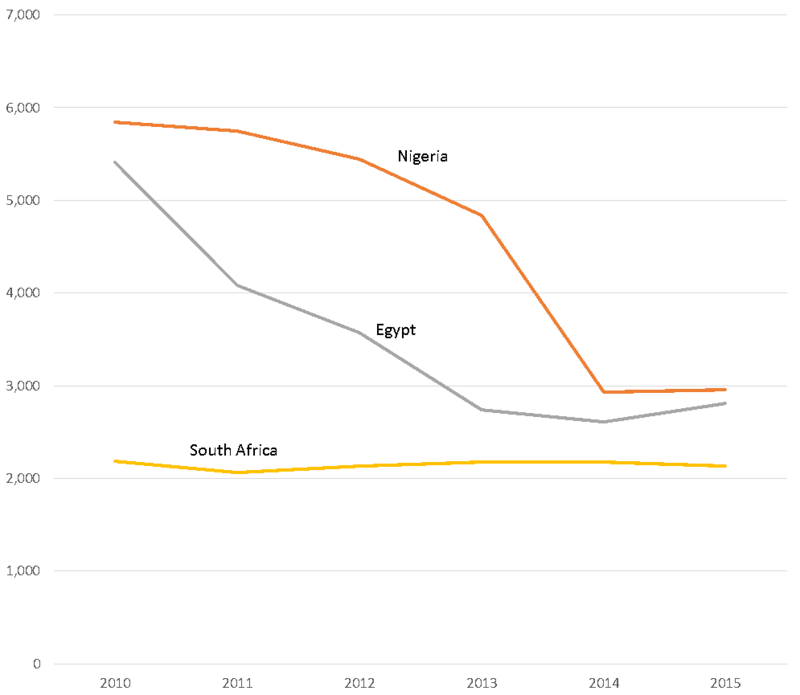 With the decline of activity by Egypt, Nigeria, and South Africa, the burden of peacekeeping contributions were more evenly spread among troop contributing countries in 2015 than in 2010 (figure 5). While lowered contributions from some powerful African states may be an operational loss, they also leave the continent less reliant on any particular contributing country and with a more diversified group of stakeholders underpinning the collective security burden. Figure 5. Top African Contributors to UN Peacekeeping Operations, 2010 and 2015. The diversification of continental peacekeeping contributions also clarifies the salience of regional proximity. Without states like Egypt, Nigeria, or South Africa willing and able to deploy robust military capabilities to longer-distance missions, conflict-prone areas have received peacekeepers mostly from nearby states. Indeed, the increased deployments of African peacekeepers have flowed mostly from one neighbor to another. When disregarding personnel contributions that number under a few hundred, virtually all peacekeeping contributions examined here target close-by insecurity. On one hand, this follows a rationale of self-interest. It presumably allows states to curb conflict before it infiltrates the peacekeepers’ homelands, fortify bilateral and regional relationships, and take action at a discount before it becomes more costly to an already resource-stretched region. On the other hand, this arrangement raises concerns that neighboring countries may be more focused on pursuing their particular interests over the stabilization priorities of the country in crisis. For this reason, having missions authorized by the UN and comprising troops from outside the region is of particular value. Nevertheless, the expansion of African peacekeeping capabilities is a victory for multilateralism and African efforts to overcome its collective security challenge—a goal that was at the heart of the African Union’s formation. Daniel Hampton, “Creating Sustainable Peacekeeping Capability in Africa,” Africa Security Brief No. 27, April 30, 2014.